The Ergobaby Company only makes a few products, and they make them well. Their breastfeeding pillow is no exception. Unique in design, the Natural Curve Nursing Pillow does exactly what it says it does: it brings the baby up to the breast, encourages tummy-to-tummy breastfeeding, and keeps the baby's head in a raised up position. The Ergobaby Company has been around since 2002.They are well known for their comfortable carriers that hold babies in a natural position. Ergobaby also makes baby carrier accessories, swaddle blankets for newborns, and the Ergobaby Natural Curve Nursing Pillow. The Ergobaby Company's mission is to design products that are comfortable but also ergonomic. Ergonomic means that the products are safe, they encourage proper body positioning, and they help to prevent physical stress and bodily injury for both babies and parents. The Ergobaby Natural Curve Nursing Pillow is specifically designed for breastfeeding women by lactation experts and nursing mothers themselves. What makes this pillow different is the unique curve on the body side of the pillow. Unlike other C or U-shaped pillows, the Natural Curve Nursing Pillow is not flat on the top. Instead, the top of the pillow has a downward curve. When you place your baby on the curve of the pillow facing you, your baby's belly will tilt toward your belly. And, since the pillow has raised sides, the baby's head will be positioned higher than his tummy. Placing a baby's head higher than her belly helps with digestion, and that is good for breastfed babies as well as bottle-fed infants. It's also a very good position for preemies and babies who suffer from reflux. Firmness: This sturdy, firm pillow is made out of a high-density polyurethane foam. It supports the weight of your baby so that he will not sink into the pillow and pull away from you. Cover: The pillow's removable cover is so soft and comfortable against your baby's skin. The inner lining to keep leaks, spills, spit-ups and drool from going through to the foam underneath. When the cover needs to be cleaned, it is machine washable and can be placed in the dryer. If necessary, the foam pillow can be spot cleaned and allowed thoroughly to air dry. Height: This breastfeeding pillow is high enough that you won't need to place extra pillows underneath it if you're tall or have a long torso. The height and firmness of this pillow can decrease slouching and the need to lean over to nurse. It can also help to prevent back pain and strain on the muscles of your back, neck, and arms. Whether you have a small waist or a higher waist circumference, I found that this pillow fits comfortably around the waist of women of different sizes. I really like the tummy-to-tummy position that this pillow naturally creates. When the baby is laying on the pillow correctly, the baby's head is raised up and in an excellent position to encourage a good breastfeeding latch. The firmness of the pillow helps prevent the baby from sinking down. It's easy to see that this pillow will not lose its shape. The pillow cover is so soft to the touch. It's also durable and machine washable. This is a quality product. From the foam to the cover to the zipper, you can tell that the quality of this pillow is high, and it will last for a very long time. This pillow is not just for breastfeeding moms. It can also be used to promote good posture and provide support for your baby if you are supplementing or exclusively bottle feeding. This nursing pillow is more expensive than many of the other nursing pillows available. There are only two styles. The pillow is sold with the tan and brown cover, but if you want the grey and yellow pattern you have to buy it separately at an additional cost. 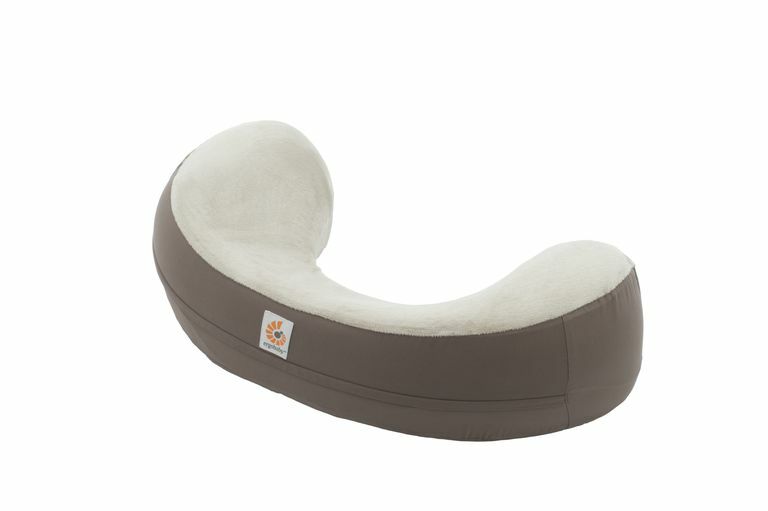 The Natural Curve Nursing Pillow cannot be used for tummy time like some of the other pillows available. It could use a handle. The pillow is very firm, so if you are holding your baby and go to grab it, it's hard to grasp with one hand. A handle would be helpful for grabbing the pillow when you're ready to nurse or just to transport it from one room to another while you're holding your baby. Is The Natural Curve Pillow Worth It? A good nursing pillow should perform a few essential functions when you're breastfeeding: it should lift your baby up into a better position for latching onto your breast, it should relieve stress on your back, arms, neck, and shoulders, and it should support your baby's head and body. While testing out The Ergobaby Natural Curve Nursing Pillow for this review, I found that it does all this and more. Even though this pillow is on the expensive side, I do think it's worth it. In the long run, the quality and the design of this pillow will outperform and outlast other less expensive breastfeeding pillows on the market. Overall, I'm impressed with this product. I really like the Natural Curve Nursing Pillow, and I think you will, too. Styles: The pillow is available with a Brown/Tan cover. Once you have the pillow, you can purchase an additional cover in a Grey/Yellow pattern. Where to Buy It: You can get your Natural Curve Nursing Pillow at Ergobaby.com, Amazon, and buybuyBABY. Disclaimer: A product sample was provided by the manufacturer.